There’s a swell new record store in Winooski, Vermont, Autumn Records (not, I assume, named after the record label home of the Beau Brummels, but who knows? ), and on a recent visit I was flipping through the racks and came across something so odd and so of-its-moment, so quintessential an example of the jumble-sale aesthetic of 1967 pop, that it should be on display somewhere, like on this blog. 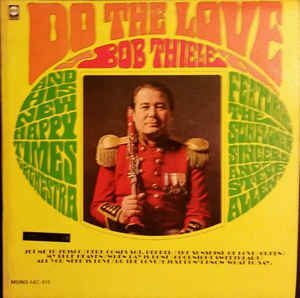 On Do the Love, the distinguished jazz producer and label executive Bob Thiele, whose name is in the credits of dozens of LPs that belong in any basic collection, is accompanied by – and I want to quote this exactly – “His New Happy Times Orchestra Featuring the Sunflower Singers and Steve Allen.” Thiele is dressed in Sgt. Pepperesque marching band costume. The cover typeface resembles west coast rock ballroom posters. Some of the song titles: “Jet Me to Frisco,” “The Sunshine of Love,” “Here Comes Sgt. Pepper.” There are also a few quite old tunes: “My Blue Heaven,” “Goodnight Sweetheart,” “When Day is Done,” done in period style. Because there was, in 1966 and through 1967, a convergence of trippy flower power and antique whimsy, a new age/jazz age fusion, a decision to skip backwards a few decades. Do the Love, a perfectly pleasant album (a YouTube clip identifies the title track as a “tittyshaker soul instro”), sits right in the neo-old-timey sweet spot, for which one can blame “Winchester Cathedral” and groups like the Beatles, the Youngbloods, the Bonzo Dog Doo Dah Band, the Lovin’ Spoonful. Mostly “Winchester Cathedral,” by a British studio ensemble called the New Vaudeville Band. Nancy’s daddy, meanwhile, took a swing at “Winchester Cathedral” itself, and he could not sound more miserable. He could not get a fix on it, and his interpolations (“You didn’t ding-dong,” he admonishes the edifice) are painful. He was not alone in stumbling through this uncomplicated ditty. “Ah hah!,” A&R people must have thought as the song climbed the charts: “Here’s something our long-in-the-tooth middle-of-the-road artists can do that the kids will dig.” So it was covered and covered, and parodied (by Homer & Jethro – “It set music back now at least fifty years” — and by Allan Sherman as “Westchester Hadassah”). A group called the New Happiness (not to be confused with Thiele’s New Happy Times Orchestra) released it as a single on Columbia Records, lead vocal by Bruce “Smooth” Lundvall (Mr. Lundvall became one of the most respected execs in the music industry). Such was the power of “Winchester Cathedral” that Rudy Vallee re-emerged with an album (Hi Ho Everybody) to capitalize on his vocal mannerisms being back in vogue. Also re-emerging, on Warner Brothers, was Jimmy Durante, whose 1966 album was titled after the inescapable, undeniably peppy, past-evoking tune “One of Those Songs.” Tony Randall cut an LP called Vo, Vo, De, Oh, Doe. (The album, like Vallee’s, had the Geoff Stephens song, of course.) Another actor, George Segal, did an album of ragtime-jazz (“Yes Sir That’s My Baby,” “Bye Bye Blackbird,” “The Moving Picture Ball”) called The Yama Yama Man. With ’67 came the Innocence’s single of “Mairzy Doats,” Spanky & Our Gang doing “Brother Can You Spare a Dime,” the stylistic influence of Bonnie and Clyde, the anything-goes spirit of Sgt. Pepper (“With a Little Help from My Friends” has a touch of vaudeville in there). Which brings us back to Do the Love. Are you not intrigued by the idea of Steve Allen singing, in New Vaudeville Band mode, “My Blue Heaven”? Or by the Sunflower Singers doing the Cashman-Pistilli song “Jet Me to Frisco” (“That’s where the flowers are growing,” the lyric tells us)? The liner notes insist “It is Mod and it is timely.” Yes, everything old was mod. After all, wasn’t one of the hippest clothing stores in London in 1966 called Granny Takes a Trip? Steve Allen financed a number of Thiele enterprises, notably Hanover/Signature Records, the home of the Nutty Squirrels (a jazzy Chipmunks knockoff) and Buck Hammer, a “rediscovered” old pianist whose technique was so strong, it was like he was playing with three hands. Which, thanks to overdubbing, he (really Steve Allen) was. Thiele also came up with many showcases for his wife, Teresa Brewer — among them, on his Flying Dutchman label, an album backed by “Oily Rags,” a British band formed from (as I recall) former members of Heads, Hands and Feet. Then there was his straight jazz stuff for Impulse! etc. A remarkable career, and a discography that includes so many essential albums. For some reason, “Do the Love” doesn’t even appear on his Wiki pages; I’d never heard of it until I stumbled on that used copy. One thing I was going to mention in my post, but it would have led to a maze of connections, was the George Segal “A Touch of Ragtime” album he produced on Signature; I wanted to confine my musings to the ’60…Thanks for chiming in.